All vacuum inlet valves on this page have dual voltage. A connection for wiring low voltage on the backside and two small holes 3/8" apart on the front side to supply 110 volts to an electrified hose and power head. Electric valves can also receive any type of hose including Basic, Low Voltage, and Stretch. If you do not have valves with 110 volt connections click here for Basic Vacuum Inlet Valves. These electric inlet plates are used in every home for all central vacuum brands. SuperValve Electric Vacuum Outlets have a permanent 110 volt connection plug. ElectraValve Electric Vacuum Outlets have a removable 110 volt connection plug. SuperValve and ElectraValves are not interchangeable when it comes to replacements but both can be used for new installations in new construction and existing homes. 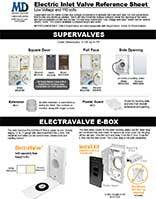 More information on SuperValve Electric Inlets and ElectraValves can be found by reading the pdf located to the right. It is recommended an electrician installs and replaces electric inlet valves. Full Face Electric Super Valve Inlet Cover Kit. Be sure to watch the video on how to replace valves. Hayden Mfg Assembly #2050. Available in White, Ivory, and Almond. Square Door Electric Super Valve Inlet Cover Kit. Be sure to watch the video on how to replace valves. Hayden Mfg Assembly #1750. Newest Model! Full-face, side-opening Super Valve Inlet Cover Kit. Be sure to watch the video on how to replace valves. Replaces #2050 Full-Face SuperValve. The E-box ElectraValve is the new ElectraValve from Vaculine-Canplas and is not compatible with older ElectraValves which are now out of production. Made by Vaculine/Canplas 775850. Available in Almond or White. Use as many of these as needed when the wall is too thick, causing the mounting plate in the wall and wall plate not to meet. Each extension adds 3/4 of an inch and can be cut to shorter sizes. Trim plates hide imperfections on the wall surrounding your new inlets. Fits VacuValve inlets. Available in White, Ivory, Almond, or Black.